Today, we are featuring Art of the Home light French apple tart recipe – recette de la tarte légère aux pommes. 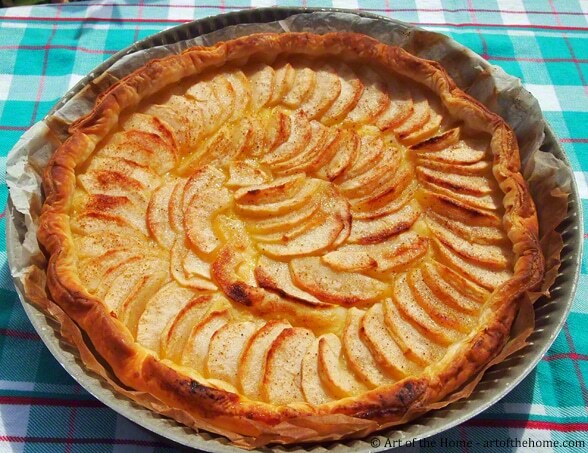 This is a variation on the traditional French “tarte aux pommes”, which typically includes a homemade compote or a crème pâtissière (pastry cream). Our light French apple tart is perfect with tea or coffee, or simply served as a light pastry dessert after a meal. We make it year-round but in the summer especially, we love to make this light French apple tart recipe — so delicious on a hot summer day and a guilt-free treat! So to get a good serving of fruit for the day and satisfy your craving for a sweet pastry, check our detailed recipe and Art of the Home suggestions below. Enjoy and bon appétit! Preheat oven to 410 °F. Wash and peel apple. Cut them in quarters, core each quarter and make very thin wedges. Set aside on a plate or bowl. Butter a 9 inch tart pan (or line baking dish with parchment paper), roll out pie crust and place inside tart pan. Prick with fork (a dozen times or so will do). Arrange apple wedges to form a circle, they should overlap a little bit. Sprinkle evenly with sugar and vanilla sugar. Add a few pinches of cinnamon on top. Dot with half of the butter (this will allow the butter to melt evenly over the apples during the baking process). Bake for 15 minutes, take out and dot with the rest of the butter. Bake for another 15 minutes. Cinnamon substitution: skip the cinnamon and dust with confectioners’ sugar instead. Light French Apple Tart à la mode: add a scoop of vanilla ice cream for a special dessert. When in France, we love the Madagascar vanilla ice cream by Carte D’Or but in the US, we make our own homemade Madagascar vanilla ice cream – si bon!